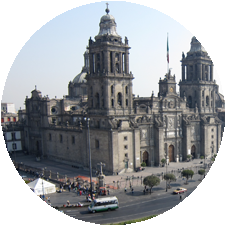 Mexico City, DF in Mexico is a part of the Logistics Plus® network. This office provides LTL and truckload brokerage, air and ocean freight forwarding, warehousing and distribution, project cargo, import/export, and global trade compliance services. Mexico City is the federal district, capital of Mexico and seat of the federal powers of the union. It is a federal entity within Mexico which is not part of any one of the 31 Mexican states but belongs to the federation as a whole. Mexico’s capital is both the oldest capital city in the Americas and one of two founded by Amerindians (Native Americans), the other being Quito. The city was originally built on an island of Lake Texcoco by the Aztecs in 1325 as Tenochtitlan, which was almost completely destroyed in the 1521 siege of Tenochtitlan, and subsequently redesigned and rebuilt in accordance with the Spanish urban standards. In 1524, the municipality of Mexico City was established, known as México Tenochtitlán, and as of 1585 it was officially known as Ciudad de México (Mexico City). Mexico City served as the political, administrative and financial center of a major part of the Spanish colonial empire. After independence from Spain was achieved, the Federal District was created in 1824. Mexico City is also home to a Logistics Plus office where we proudly serve both small and large businesses throughout the region. If you’re located in Mexico City, or any other surrounding community, your friends at Logistics Plus are ready to provide you with local, domestic, and global transportation and logistics services. Additionally, we’ll show you how our people in Mexico put the “plus” in Logistics Plus by doing the big things properly, and the countless little things, that together ensure complete customer satisfaction and success!